This is a little project I’ve been working on for the past few weeks as time allows. It’s a potentially all-band receiver (and maybe a transceiver in the future) that uses a Quadrature Sampling Detector (“QSD) and a few packs of op-amps to make a phasing-type single signal receiver. I have it running on my bench right now, using an Si5351 as the VFO. 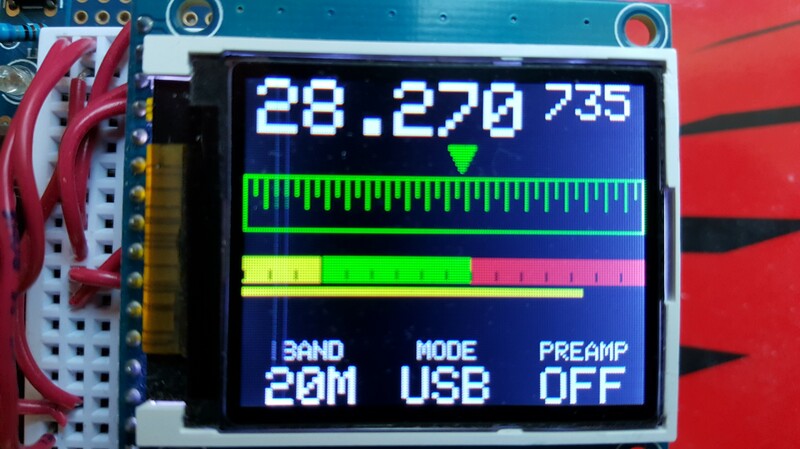 Initial test results are promising, with SSB opposite sideband rejection >45 dB and input sensitivity near 0.1 uV. The QSD is of the “Tayloe” type, using only 2 IC’s. The only tuned circuit in the receiver is the input bandpass filter for the desired band. It’s very easy to make. I’ll be supplying schematics as I get time to document it, as well as design files for the SMD PCB’s I’m developing along the way. Meanwhile, here’s the block diagram. I’ll start publishing more information as I get time to write it up, but for now here’s a picture of the very nice color display I developed, showing the the digital and slide-rule frequency readouts and the S-meter kicking up to well over S9.